In a couple of decades, you may be able to board a train at London's St Pancras Station, chug through the Chunnel traveling east, and – eventually – end up at New York City's Grand Central Station, having never disembarked. 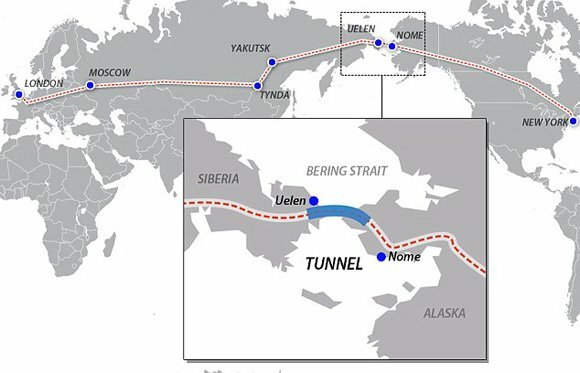 Yes, that 65-mile tunnel under the Bering Strait separating Siberia and Alaska, first proposed in 2007, is back on again. And this time its chances of actually being built are strengthened by a 500-mile link from the existing Trans-Siberian line to the Eastern Siberian city of Yakutsk, scheduled for completion in 2013. The tunnel – twice the length of the English Channel–spanning Chunnel – was given the green light this week at a conference attended by delegates from Russia, the US, UK, and China, held in that very town of 200,000, fondly known as "The Coldest City on Earth". At the conference, the project was blessed by top Kremlin officials, according to World Architecture News, including Aleksander Levinthal, Russian President Dmitry Medvedev's deputy federal representative for the far east – of Russia, that is. The entire rail-and-tunnel project's price tag has risen a bit in the years since it was first proposed – from a projected £32bn in 2007 to £60bn today ($53bn, $99bn), according to World Architecture News. Actually "first proposed" isn't quite accurate. In 1905 – the year, by the way, of the Potemkin Mutiny – Tsar Nicholas II suggested that such a rail link be built. World War One put a crimp in that dream, as did the 1917 Russian Revolution and Nicholas II's 1918 execution. This time out, however, the Kremlin appears to be serious – although Alaskans and residents of the other 49 states and Canada's 10 provinces and three territories may need some convincing. The goal of the railway, after all, wouldn't be merely to offer sub-zero tourism, but to open up trade routes through which Siberia's immense cache of raw materials could flow to the US. But seeing as how the Russian Bear has used – and likely will use again – its trade powers to press its influence on countries to its west, Canadian and US leaders might not be keen on developing a dependency on its neighbor across the Bering Strait. Still, if all were kept on the up-and-up, the implications of such a rail link could be substantial. According to Inhabitat, the tunnel's highly efficient rail line could carry 100 million tons of freight per year. World Architecture News cites unnamed "experts" who are confident that the link could carry 3 per cent of the world's freight, and generate £7bn ($11.5bn) in revenues per year, leading to a quick return on investment. Of course, who exactly would make that investment, especially in these turgid economic times, is as big if not bigger a stumbling block than the project's political implications. And the engineering challenge? Tunneling deep under the sea and traversing Big Diomede and Little Diomede Islands in some of the world's most remote and inhospitable territory?